Preparing to sell a home, after a long winter, includes getting the lawn in tip top shape. With a limited amount of work, and the following spring lawn care basics, your property will stand out and leave a great first impression on home buyers. Let's get started! After a long winter, your yard will likely be depleted of nutrients. Applying a quick-release fertilizer will promote healthy grass roots and a greener yard in less time. Homemade lawn fertilizers and slow-release fertilizers are also great options. Depending on the climate in your area, you may need to fertilize numerous times depending on how long your house is on the market. Talk to your local lawn and garden professionals for tips on the best fertilizer to use on your lawn. In the spring, it's important to keep your lawn trimmed so it's always presentable to potential buyers. You'll want to avoid mowing when the ground is soggy. Early in the season, avoid using the lowest mower deck height setting because it can expose the grass's root system which may cause stress, making it harder for grass to grow. Once the lawn thickens and matures you can use a lower mower deck setting. Use an edge trimmer to keep your property looking well-manicured. If you use a weed-busting fertilizer, you won't have to worry about tackling lawn weeds. If you decide not to fertilize, you can use a weed killer product from your local garden center or simply pull the weeds when they're young. Be careful when picking out a weed killer-- some weed killers are designed specifically for lawns (won't kill the grass) and others will kill everything they touch. Without good soil, your lawn will not thrive and potential buyers may be turned off before they even reach the front door. If your lawn is spotty with discolored areas, the soil may need to be amended to promote the absorption of nutrients. The pH of the soil may also be a factor worth looking into as it affects how the soil attracts and releases nutrients. If you have pets, you may have areas of dead grass where they urinated. Planting new grass seed or using a product designed to lower nitrogen, will clear up the brown spots. 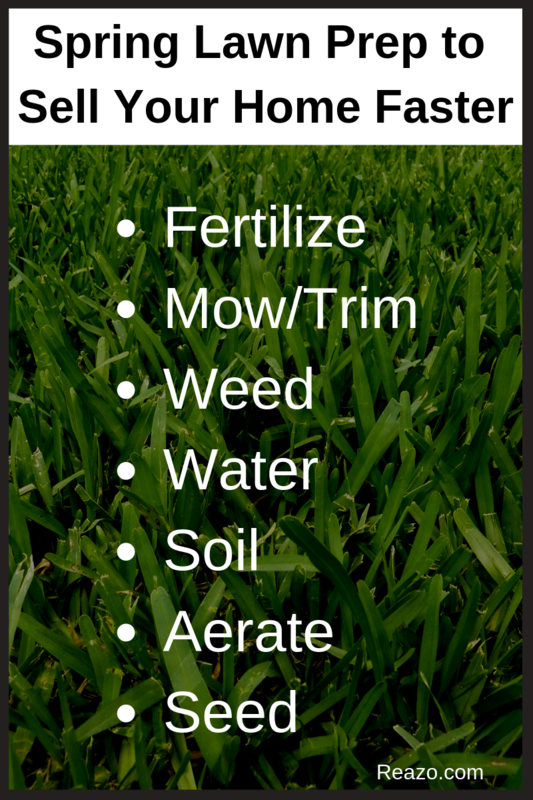 Consider talking to a local expert to determine which nutrients the soil needs to help nourish your lawn. If your lawn is compacted, due to clay or heavy foot traffic, the roots of the grass won't be able to absorb water and nutrients. Consider renting an aerator to help improve the health of your lawn. Aerators pull out small plugs of lawn, allowing more water and air into the soil. Scott's recommends aerating your grass during peak growing season, which gives the grass an opportunity to recover quickly. NOTE: Because aerating leaves plugs of soil on the lawn, it's best to aerate at least a month before putting your house on the market to give the plugs a chance to decompose (you may choose to rake them up). After a long winter, you may notice bare spots in your yard. A little bit of grass seed will most likely take care of the problem. Simply rake the area to remove dead grass, spread seed, and water lightly at least 2x per day to get the new roots to take hold. You might consider putting up temporary fencing to protect the seeded area from pets. Mow around the new grass until it has time to mature (up to 1 month). Creating a lawn that will draw buyers in can be as simple as applying fertilizer in the spring, seeding thin areas, watering consistently in the morning, and mowing at regular intervals. Keep weeds from cropping up by using a weed killer designed for lawns, or pull weeds when they're young. Use a leaf blower or a broom to remove grass clippings from your sidewalks and driveway. If you don't have the time to tend to your yard, consider hiring a lawn service during the time your home is on the market. A beautiful lawn can make the difference between your home selling quickly or sitting on the market for months. Should I Sell My House without an Agent?